Impetigo is a highly contagious skin infection that usually occurs on the face, neck, arms, and legs. Although it is commonly seen in infants and young children 2–5 years old, this does not imply that adolescents and adults are immune to an impetigo infection. Impetigo is characterized by itchy red blisters filled with fluid, which on eruption forms a golden-yellow coating on the affected regions. The itching triggers an urge to constantly scratch and touch the blisters, leading to its spread and infection. How Long Does an Impetigo Sore Remain Infectious? Who’s Most Likely to Contract Impetigo? Impetigo is typically caused by Streptococcus pyogenes and Staphylococcus aureus and can occur on healthy skin. These bacteria make their way into the skin through minor cuts, bruises, injuries, skin ailments such as eczema, chickenpox, and other viral rashes. Initially appearing as pimples, impetigo sores turn into clear fluid-filled blisters that burst open and form honey-colored crusts. The sores are accompanied by itching and redness. Nonbullous impetigo is the most common form and can be caused by both bacterial species of S. aureus and S. pyogenes. It is also known as crusted impetigo as it begins with tiny blisters that weep fluid and eventually leave behind a yellowish-brown flaking on the affected region that resembles a honey coating. Bullous impetigo does not occur much and is mostly caused by S. aureus. The blisters formed are much larger than those of nonbullous impetigo and contain clear fluid that turns cloudy before bursting due to the release of toxins. The sores of both nonbullous and bullous forms of impetigo do not leave scars once they are healed. Ecthyma is a severe form of impetigo that penetrates deep into the skin of the affected individual, taking the form of an ulcer. It can be caused by both strains of bacteria individually or as a combination. These sores take a longer time to heal and leave scars on recovery. The weeping from the sore subsides. The crust has fallen off. The patient has successfully completed 48 hours of antibiotic medication and the sores have started healing. Impetigo is a common dermatological problem in infants and young children aged 2–5 years, especially those attending playgroup and day care facilities. Instill the habit of frequent hand washing with soap and water especially after touching sores and scabs. Keep your child’s fingernails short and prohibit them from picking nose and scabs. Avoid sending an infected individual in public places if he is afflicted with impetigo until he has been on medication for 48 hours and the sores have started healing. Try to cover sores with an occlusive waterproof dressing when going out if necessary. Clean the affected areas and keep them covered. Encourage yourself and your child to use your own towels, face cloth, and bedding. Sharing should be restricted. Throughout the course of infection, ensure that you wash the infected person’s towels, clothes, and bedding in hot water. Ensure proper disposal of used dressings by placing them in a separate plastic bag before putting them in the garbage can. Wash and dry your hands thereafter. A case of impetigo that seems to worsen can invade the tissues deep inside and can lead to conditions potentially fatal to health. Psoriasis – A skin disease. You should seek medical advice at the first instance of an impetigo suspicion either in you or your child. This becomes mandatory if you have been present in the vicinity of an infected individual in the past. If your rash worsens, if you develop a fever or swelling, or if the color of your urine becomes pink or reddish brown, make sure to see a doctor promptly. Although impetigo clears up on its own in a few weeks, it is recommended to seek medical help as it is an infectious disease. This will help limit the spread of infection and ease the distress within a lesser time period. Because impetigo is a result of a bacterial infection, it can be treated with an antibiotic topical cream. It is advised that you restrict touching and picking the scabs and follow the preventive measures listed above to avoid spreading the infection and to speed up the recovery process. Treatment for impetigo depends on the severity of the condition. 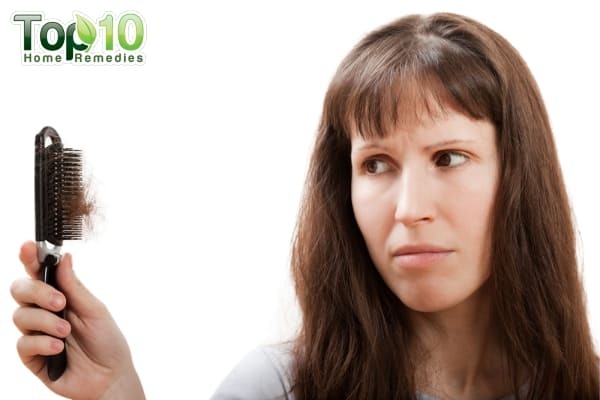 Mild cases can be treated with good hygiene and home remedies. If the infection spreads quickly or worsens or you do not get relief from the symptoms, consult a doctor. 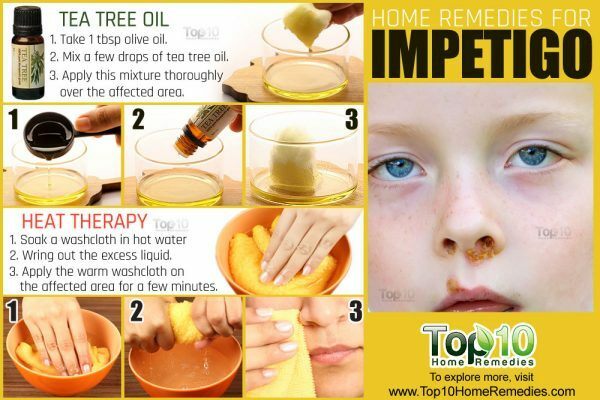 Listed below are home remedies that can help ward off impetigo. To promote healing of the skin sores, it is essential to keep the affected area clean, using either water or an antibiotic wash.
A 2013 study published in Jordan Journal of Biological Sciences highlighted the antibiofilm activity of vinegar. This can efficiently demolish the biofilm of Streptococcus, killing the bacteria. You can prepare your own antibiotic solution with white vinegar. It will help stop the spread of the infection and dry up the affected area. Mix 1 tablespoon of white distilled vinegar in 2 cups of lukewarm water. Using a cotton ball, wash the infected skin with this solution. Pat the skin dry and apply an over-the-counter antibiotic ointment. Cover the area lightly with gauze. Repeat this two to three times daily until the infection is gone. 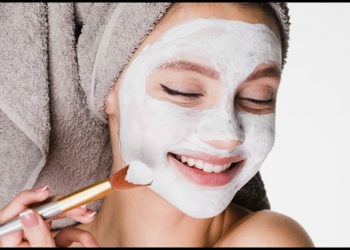 Note: Do not scrub the area while washing it as this can irritate the skin. Turmeric is an age-old remedy that has been used to treat skin infections. The active ingredient in turmeric, curcumin, is anti-inflammatory and antiseptic and can contribute to strengthening your immunity levels. It can effectively destroy S. aureus, which is responsible for impetigo infections. Mix water with 1 teaspoon of turmeric powder and make a paste. Apply this paste directly on the sores. Tea tree oil has strong antimicrobial and anti-inflammatory properties that can help fight the infection and relieve the symptoms. Add a few drops of tea tree oil to 1 tablespoon of olive oil. Apply this mixture thoroughly over the affected area. Allow it to sit for 20 to 30 minutes, and then rinse it off with lukewarm water. Do this two to three times daily for a few days. Alternatively, add a few drops of tea tree oil to a small tub of lukewarm water. Use the solution to wash the affected area a few times daily. Note: Oral consumption of tea tree oil is linked to side effects including confusion, inability to walk, and rashes. Grapefruit seed extract (GSE) has antioxidant and antibacterial properties. It works as a nontoxic disinfectant and can help fight impetigo. Add a few drops of grapefruit seed extract in 2 tablespoons of water. Apply it on the affected area with a cotton ball two to three times daily. This might cause some itching in the beginning, but this will cure the infection fast. You can also take GSE supplements twice daily for a speedy recovery. Always consult your doctor before taking any supplement. Note: If you are pregnant, breastfeeding, or on medication, check with your doctor before you take grapefruit seed extract. Garlic is another effective infection fighter with natural antibiotic properties that help kill bacteria. It can also help relieve itchiness and pain. Heat 2 tablespoons of sesame oil and fry 2 or 3 minced garlic cloves in it. Cool and strain the oil. Apply it on the affected area once or twice daily for a few days. You can also try adding a few raw garlic cloves to your diet. If taking a supplement, always consult your doctor for the correct dosage. Note: Do not rub garlic directly on your skin as it may cause irritation and rashes on your skin. Manuka honey has antibacterial, antiseptic, and healing properties that can help inhibit the growth of the bacteria that cause impetigo. It also speeds the healing of the sores on the skin and gives a boost to your immunity. Spread some manuka honey on the affected area. Leave it on for a few hours before washing it off with lukewarm water. Repeat this a few times daily for a few days. Also, eat 1 to 2 teaspoons of manuka honey daily to help your body fight the bacteria. Note: The use of raw honey should be avoided in infants or children under 12 months as it can lead to botulism. The herb goldenseal has antibacterial and antiseptic properties that can help disinfect the skin sores and blisters. It also helps strengthen the immune system. Prepare a cup of herbal tea by steeping 1 teaspoon of goldenseal powder in 1 cup of hot water for 10 minutes. Strain the liquid and allow it to cool. Use the tea to clean the infected area twice daily for a few days. Alternatively, apply goldenseal cream or lotion, readily available in stores, on the infected skin two to three times a day for about a week. You can opt to take this herb in supplement form. For correct dosage and suitability, consult your doctor. Note: Avoid the use of goldenseal during pregnancy, when breastfeeding, or in infants as it is unsafe and can cause brain damage (kernicterus) in babies. Aloe vera is effective in treating impetigo due to its antibacterial, anti-inflammatory, antiseptic, and skin-repairing properties. Additionally, its antioxidants boost your immunity to help fight the infection. Cut open a fresh aloe vera leaf and extract the inner gel. Apply it directly on the affected skin and leave it on for at least for 30 minutes. Reapply this two to three times daily for a week. Also, drink aloe vera juice daily for strong immunity. The mineral zinc plays a key role in improving immunity. It interacts with a cellular process that neutralizes bacterial infections and helps balance the normal immune response. It can even reduce the risk of impetigo among premature babies. 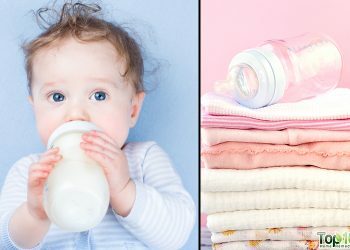 A 2012 study published in the Pediatric Infectious Disease highlighted the effects of zinc supplements in babies aged less than 120 days suffering from acute bacterial infections. To help treat impetigo, include zinc-rich foods in your diet. Dietary sources of zinc include beans, nuts, some shellfish, whole grains, and fortified cereals. You can also take a zinc supplement of 15 to 25 mg per day to fight the infection. Always consult your doctor before taking a supplement. Eating a healthy diet will help fight the infection, boost immunity, and promote fast recovery. Include fresh vegetable and citrus fruit juices in your diet. Use vegetables and fruits with high levels of antioxidants to help the body fight off the infection. Drink 2 to 3 glasses of fresh apple juice daily. Avoid refined sugars and fried foods for some time. 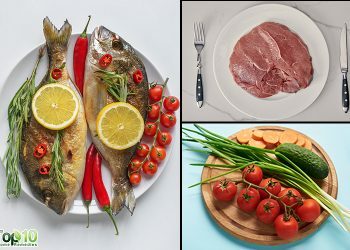 Reduce or eliminate red meats from your diet until the infection has cleared. Make sure to drink an ample amount of water throughout the day to keep your body hydrated. Do not touch the affected skin too often. Do not pick or scratch the areas affected by impetigo. Wash your hands regularly with antibacterial soap and avoid sharing towels. Take a bath or shower with warm water regularly. Wash linens and clothes in hot water and dry them under direct sunlight. Clean surface areas in the home with antibacterial products. Stay at home for a few days to prevent spreading this contagious skin problem to others. Impetigo is a skin infection that is caused by a lesion or injury that acts as an entry point for the causative bacteria. 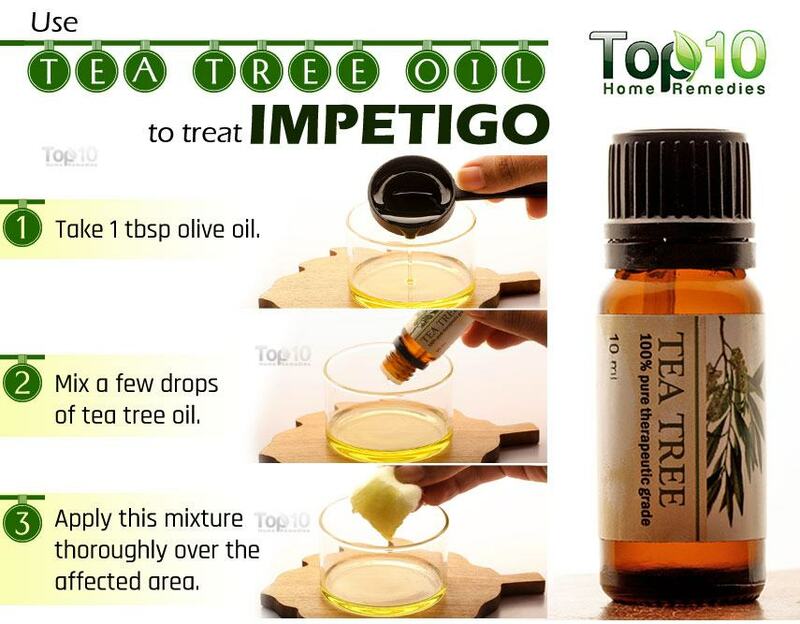 Impetigo can be cured effectively with good hygiene habits and by following preventive measures and taking the medications prescribed by the doctor. As an alternative, you can use some natural remedies that have been vouched for their antibacterial and anti-inflammatory properties. Consult your doctor if your case worsens or shows no sign of improvement. Ismael, F. N. ( Vinegar ) as Anti-bacterial Biofilm formed by Streptococcus pyogenes Isolated from Recurrent Tonsillitis Patients , in vitro. Jordan Journal of Biological Sciences. https://platform.almanhal.com/Details/Article/39443. Nguyen TA, Friedman AJ. Curcumin: A Novel Treatment for Skin-Related Disorders. JDDonline. 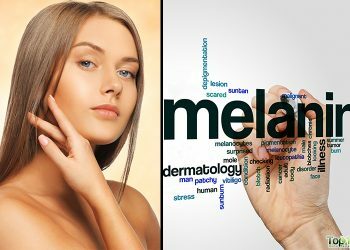 http://jddonline.com/articles/dermatology/S1545961613P1131X/1. Published October 2013. Kwieciński J, Wójcika K, Eick S. Effects of tea tree (Melaleuca alternifolia) oil on Staphylococcus aureus in biofilms and stationary growth phase. International Journal of Antimicrobial Agents. https://www.sciencedirect.com/science/article/pii/S0924857908004445. Published December 17, 2008. Heggers JP, Cottingham J, Gusman J, et al. The effectiveness of processed grapefruit-seed extract as an antibacterial agent: II. Mechanism of action and in vitro toxicity. Journal of alternative and complementary medicine (New York, N.Y.). https://www.ncbi.nlm.nih.gov/pubmed/12165191. Published June 2002. Palaksha MN, Ahmed M, Das S. Antibacterial activity of garlic extract on streptomycin-resistant Staphylococcus aureus and Escherichia coli solely and in synergism with streptomycin. Journal of natural science, biology, and medicine. https://www.ncbi.nlm.nih.gov/pmc/articles/PMC3217283/. Published 2010. Lee TY, Lam TH. Contact dermatitis due to topical treatment with garlic in Hong Kong. Contact Dermatitis. https://onlinelibrary.wiley.com/doi/abs/10.1111/j.1600-0536.1991.tb01697.x. Published April 11, 2006. McLoonea P, Warnock M, Fyfe bL. Honey: A realistic antimicrobial for disorders of the skin. Journal of Microbiology, Immunology and Infection. https://www.sciencedirect.com/science/article/pii/S168411821500033X. Published January 30, 2015. Cech NB, Junio HA, Ackermann LW, Kavanaugh JS, Horswill AR. Quorum Quenching and Antimicrobial Activity of Goldenseal (Hydrastiscanadensis) against Methicillin-Resistant Staphylococcus aureus (MRSA). Planta medica. https://www.ncbi.nlm.nih.gov/pmc/articles/PMC4527992/. Published September 2012. Pawar PL, Nabar BM. Effect of Plant Extracts Formulated in Different Ointment Bases on MDR Strains. Indian Journal of Pharmaceutical Sciences. https://www.ncbi.nlm.nih.gov/pmc/articles/PMC3003181/. Published 2010. The Pediatric Infectious Disease Journal® Newsletter : The Pediatric Infectious Disease Journal. The Pediatric Infectious Disease Journal. https://journals.lww.com/pidj/Fulltext/2012/10000/The_Pediatric_Infectious_Disease_Journal_.1.aspx. Gardner PT, White TAC, McPhail DB, Duthie GG. The relative contributions of vitamin C, carotenoids and phenolics to the antioxidant potential of fruit juices. Food Chemistry. https://www.sciencedirect.com/science/article/pii/S0308814699002253. Published December 3, 1999. Desbois AP, Lawlor KC. Antibacterial Activity of Long-Chain Polyunsaturated Fatty Acids against Propionibacterium acnes and Staphylococcus aureus. Marine drugs. https://www.mdpi.com/1660-3397/11/11/4544/htm. Published November 13, 2013. Singh AK, Singh R, Firdaus Z. Curcumin Quantum Dots Mediated Degradation of Bacterial Biofilms. Frontiers in Microbiology. https://www.frontiersin.org/articles/10.3389/fmicb.2017.01517/full. Published July 28, 2017. Teow S-Y, Liew K, Khoo AS-B. Antibacterial Action of Curcumin against Staphylococcus aureus: A Brief Review. Journal of Tropical Medicine. https://www.hindawi.com/journals/jtm/2016/2853045/abs/. Published November 13, 2016.